When was the last time you replaced your kitchen faucet? You’re on top of replacing other kitchen staples when they start malfunctioning, from the toaster to the fridge, but your faucet? Faucets can get gummed up with mineral deposits over time and become less effective, and old piping can lead to breaks, clogs, and flooding more easily. If you’re remodeling and it’s the last thing you’ve thought to upgrade, you may be out of budget already. 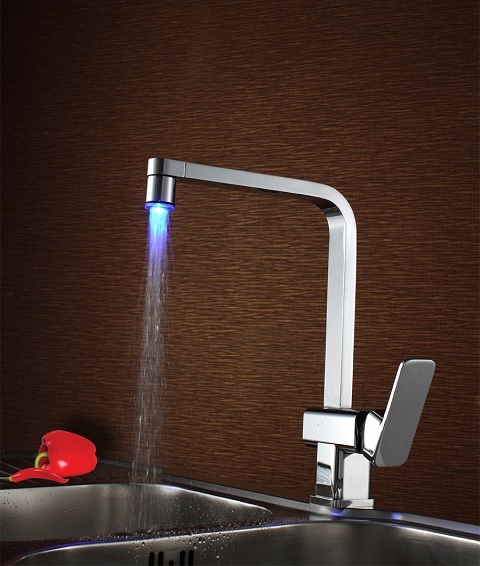 Don’t fret, there are kitchen faucets available that look fancy but won’t break your wallet. Before you commit to a design, you need to check your specs of your old kitchen faucet for compatibility. How many holes are available in your sink, and how many does your current faucet use? If you’re installing a new kitchen faucet that needs fewer holes than the previous one, you can just cover up the gap. You cannot, however, drill an extra hole into your sink if you’re short one. 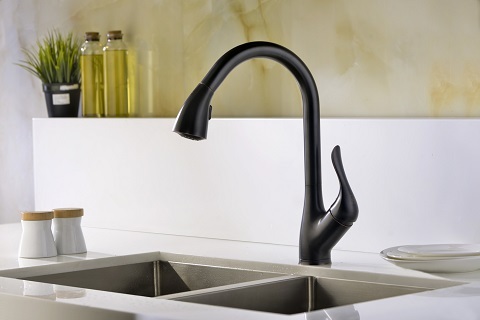 Your kitchen faucet is typically made of brass to minimize risk of lead leaching into your water, but can have many kinds of finishes including chrome, bronze, and stainless steel, and it’s up to your particular aesthetics which finish is going to work best for the kitchen’s overall look. Remember that even though we’re talking faucets on a budget, going too cheap can end up backfiring and making your replace your faucet much sooner than intended. 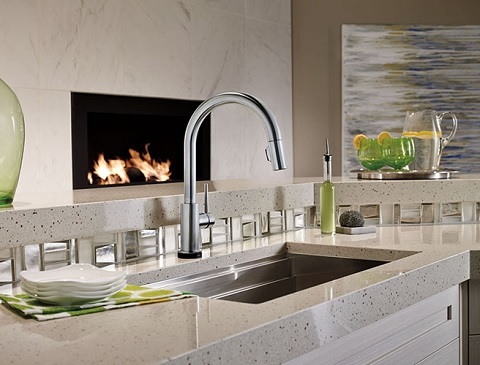 Read brand reviews and get a sense of how long the faucet you want holds up in others’ homes. The good news is unless you want to replace your entire faucet, sink, and piping combination, you don’t have to replace your entire sink at once. You can mix and match these parts to your liking at a later date and not have to pay a large price immediately and have heavy installation afterwards. Something you may not think about until you’re looking at new faucet options is how you want to control your water. One or two handles attached to your faucet is standard, and each has their own kind of benefit. You can get more control with separate hot and cold handles, but using a single handle is easier if you’re cooking with your hands full. Typically, you’re going to find more one-handle faucets when accounting for affordability because it’s cheaper to not make a second handle. An important feature of kitchen faucets is whether or not they have a sprayer and what type it is. A pull-out sprayer has a long hose inside it so you can spray bigger items with more ease. In the kitchen, this means you don’t need to run water and then grab a separate sink piece to spray your dishes, wasting less time and water. There is also the pull down sprayer type, which is similar but with a key difference. They tend to be taller faucets with a shorter hose within that is good for filling up larger pots and pans, but trading out the longer reach of the pull-out hose. It’s largely a personal choice on which is better for your kitchen, along with forgoing a pull sprayer in the faucet entirely. An affordable, nice kitchen faucet is closer to reality in your home than you may think when remodeling. 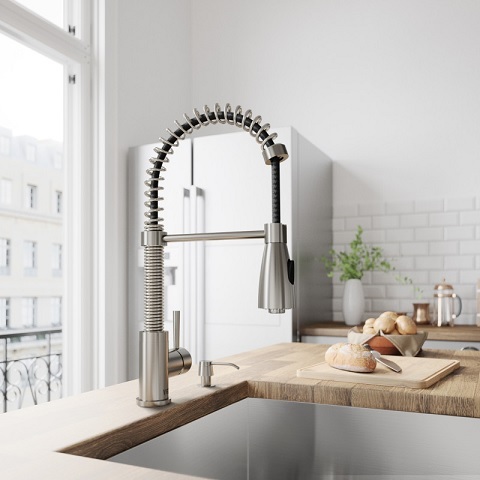 Aside from a few stylistic differences between brands, you can get an equally functional and attractive faucet much cheaper than a lot of faucets on the market; it just takes a bit of searching to find one that’s to your liking. 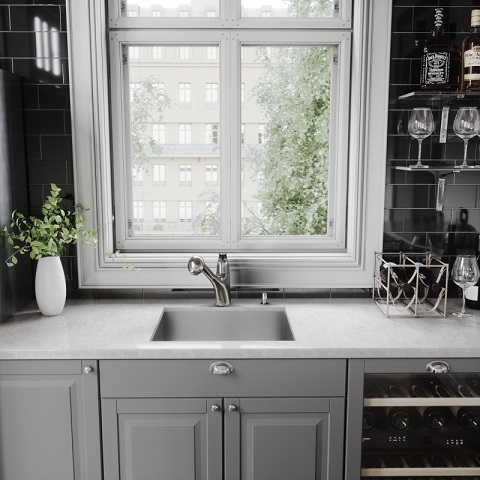 Faucets are an under-utilized area of decor in the kitchen, whatever style or theme you’re aiming for, and it’s easy to think cheaper faucets have to sacrifice looks or a decent spray head to be that way. That’s far from the truth. None of your guests or family will notice that you spent much less on a brand new faucet than expected unless you tell them about it, but they will notice that quality piece of hardware and un-gunked water pressure the first time they wash their hands. I think that’s the true staple of a kitchen. This entry was posted in Decorating Ideas and Tips, Kitchen, Kitchen Faucets and tagged faucet, faucets, Kitchen, Kitchen Faucet, Kitchen Faucets, Kitchen Sink, kitchens.